While I was in Portland the first week in October to share my book at the PNBA book trade show, I made the time to visit Ed’s House of Gems at 77th and N.E. Sandy Blvd. Was I glad that I did! 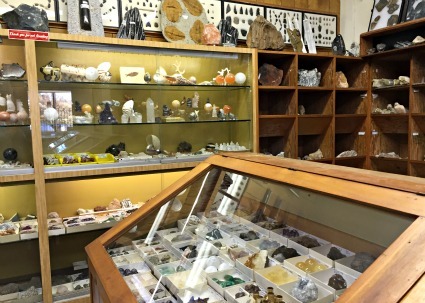 I love that store from when I used to shop there in the 1990s, and on this trip I found rock specimens to take home with me, including for gifts. When I was checking out, I told the woman helping me that I was promoting my book about G.I. Joe’s at the nearby trade show at the Holiday Inn. She called her husband to come talk to me and we had such a good time visiting! It turns out that the “Ed” in the store’s name was his dad, and he reminisced about how his dad started the rock store after World War II, just like my dad started G.I. Joe’s. 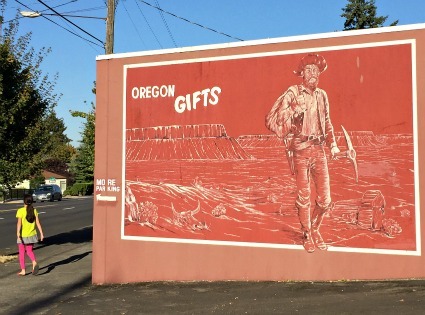 Then the two stores paths crossed when my dad started selling leisure time merchandise in Store 3 in North Portland in 1968. Dad sold items for rock enthusiasts including rock polishers. He bought them from Ed’s House of Gems! Eventually the supplier set up his own wholesale channel for the polishers, but till then, Ed’s was G.I. Joe’s supplier. What a small world it is!